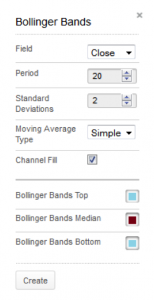 Bollinger bands are used to find market turning points, potential trading range breakouts, and trend exhaustion. The bands form an envelope drawn many standard deviations above and below a moving average. 20-period simple moving averages and 2 standard deviations are the recommended parameters. This results in bands that contain 85% of the underlying item’s prices. However, different intervals may require different average and deviation calculations. For example, analysts trying to gain perspectives on long-term periods may find 50-day means with 2.5 standard deviations optimal. You can also select colours for the upper, lower and middle lines by selecting the appropriate box to bring up a colour palette. The colour for the average (median) determines the colour for filled bands. The theory behind the bands is that the width of an envelope should be determined by the data-series itself rather than by the assumptions of the speculator, as done with percent envelopes. In this way, the envelope’s distance from the mean is a function of the market’s volatility. Sharp moves tend to occur after the bands tighten to the average (volatility lessens). Volatility tends to cycle from high to low and back again, so a period of unusual calm often leads to an explosive move one way or the other. A move outside the bands calls for a continuation of the trend, not an end to it. Often, the first push of a major move will carry prices outside the bands. This indicates strength in an up market and weakness in a down market. A sharp move outside the bands followed by an immediate retracement of that move is a sign of exhaustion. Bottoms (tops) made outside the bands followed by bottoms (tops) made inside the bands call for reversals in trends. The bands can help in diagnosing double tops and bottoms, especially when the second part of the top (bottom) is higher (lower) than the first and lower (higher) in relation to the bands. The average should give support (resistance) in bull (bear) markets. A move originating at one band tends to go to the other band in consolidating or ranging markets. This is useful for projecting price targets early on and provides revised targets as events unfold. Above is a daily chart of Rio for one year. Note how the 20-day moving average provided loose support and resistance for each short-term trend. Also note how most of the time, all trading is contained within the bands. Sharp moves after a relatively calm market tend to occur after the bands tighten to the average (volatility lessens). In August and September 2016, the bands became quite narrow and that was followed by a quick burst higher. Reason — market participants have slowed their activities and are waiting for the market to tell them where it is heading. Once a move starts, everybody jumps in. A move outside the bands calls for a continuation of the trend, not an end to it. Reason — volatility has not expanded yet to compensate for the new trend. Other indicators, such as RSI, can confirm this. Lows made below the bands followed by lower lows made inside the bands call for an upside reversal in trends. Note how Tesla made a new low in September 2016 outside the bands while the next price trough occurred inside the bands. The result was a sharp, albeit short-lived rally. An envelope based with width determined by standard deviations above and below a moving average. Standard deviation = the square root of that number.